Lusby Tiny House Plans - Build it yourself! I made this page because the Lusby tiny house plans are one of my favorite... And I don't think I'm alone when I say that. It weighs about 5400 pounds so you will need a heavy duty vehicle to tow it. Look at how tall it is! It must be pretty interesting to see one of these for the first time just driving down the road... Haha. If you're wondering, the exterior finish is made out of Cedar. The roof on this one seems to be aluminum, but there are other options for that too. Next I have a picture of the view from the inside, looking at the front door. When you come in through that door, on the left and right are two decent sized closets. You can also start to notice just how many shelves are built in to the design. There's enough shelf space for books, plates and other everyday items. The photo also gives you an idea of what the kitchen and dining is like. 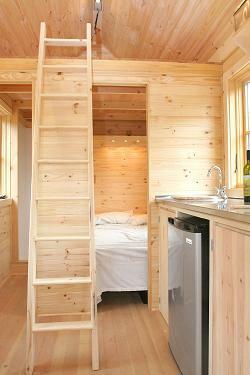 Plus the ladder that leads you to the upstairs loft bedroom. Up there the height is only 3'8", so it's pretty much for sleeping and reading. ...And whatever else you can manage. Notice how to the right of the ladder there's a sneak-peak at a downstairs bedroom. 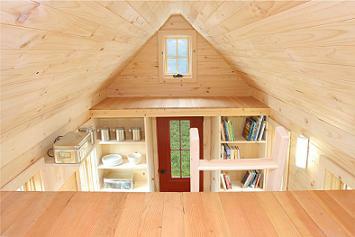 The Lusby is special because it has this extra bedroom downstairs in addition to the normal loft sleeping area. Plus if you don't need the extra bed, you can turn this into an office, storage, meditation or anything else that you can think of. As I look at these pictures I can't help but continue thinking how worth it it must be to go with the pine wall finish versus the usual drywall that we use today. This is obviously more expensive than drywall, but since the home is so small, I'd definitely splurge on this if I was able to. From up here you can see the over the entrance storage area. If you don't have stuff to store up there, it's a great spot to place some decorations. A great idea is to place some luggage or pretty boxes up there to use as decoration as well as hidden storage. It's a great spot to tuck away seasonal items and other things that you want to keep but don't use everyday. I've learned that all of these dimensions are approximate. Meaning they can be altered to fit your specific needs. A good example would be if you would rather sacrifice your loft height for more ceiling height in the main area (if you're tall). 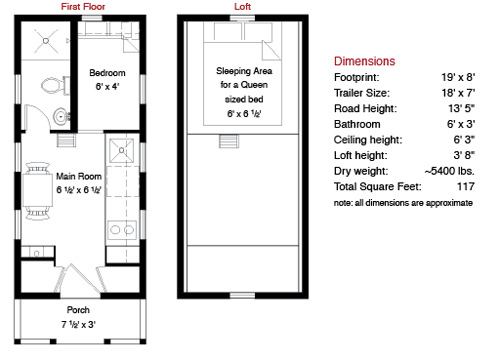 You can purchase your own Lusby tiny house plans for $859. You'll receive a consultation with the owner of Tumbleweed, Jay Shafer as well as access to one of his seminars. 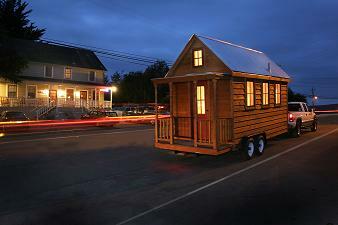 Here's a nice list I put together for most of the other Tumbleweed house designs that are available. Building one of these houses can be fun... but it's not easy! Learning to build your own, getting the building plans and more. Also read about others who've already done it. Pictures and videos too. 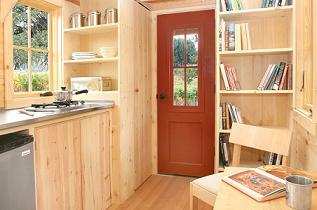 Looking for a tiny house company? Well, here they are. List of companies and builders with pictures, plans, videos and information.